Um, no she's not. Because beautiful, stylish, expert rider Mikaela picks Razz, leaving Charli with large, not so beautiful, ex-racehorse Spud. And then there are the bats. Evil creatures that threaten the lives of horses and humans by spreading the potentially deadly Hendra virus. 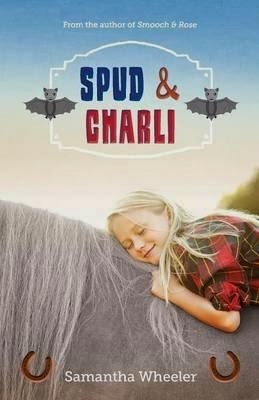 In fact, the situation is so bad that Charli just knows that the little bat found in the horses' water trough must have infected Spud. And she's definitely overheard the man who owns the neighbouring property saying he's going to kill all the horses as a result. Mmm … it turns out Charli has quite the imagination and sometimes the truth might be a little different to what she thinks! I was keen to read this book because I own horses myself and I'm very aware of the risk Hendra poses. I love the fact that Samantha Wheeler has tackled a complex issue like this in a way that makes it accessible to younger readers while clearly showing the dangers of hysteria and the importance of making decisions based on rational analysis and fact. She's even gone so far as including several pages of useful information on Hendra and bats at the back of the book. Of course, the dangers of an overactive imagination and acting before you know the truth of a situation are relevant to far more issues than just Hendra and bats, so this is a book that has wider relevance too. And let's not ignore the simple story that lies at the book's heart — a pony-mad girl finally getting her chance to live out her dream. Is there a chance she could win the gymkhana?